For Kia’s 10th consecutive appearance in the Big Game, the auto brand known for its challenger spirit took an unconventional approach. This year, Kia didn’t use a celebrity for its Super Bowl spot. This year, Kia began a movement to honor The Great Unknowns: The hard-working people of America. Starting with the proud workers of Kia’s West Point, Georgia plant who build the new 2020 Telluride SUV. The campaign not only launches Kia’s new SUV, but it also introduces an evolution of the brand’s positioning and expression that brings its challenger brand truth to the forefront: “Give It Everything.” This new positioning highlights Kia’s unstoppable spirit to try harder, work smarter, build better and sweat every detail. “Give It Everything” will launch with the Telluride campaign and be part of all Kia campaigns moving forward. 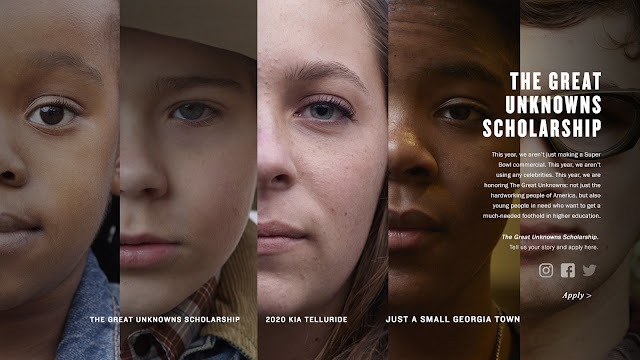 In the spirit of Give It Everything, the campaign also unveils “Just a Small Georgia Town,” a new short form documentary that uncovers the story of West Point, GA. A small town that rose from the ashes of a collapsed textile industry, relying on only its courage to see it through to the other side, before finally finding new life when Kia opened its new plant there nearly 10 years ago. But it doesn’t stop there. The money that is saved by not paying a celebrity will be used to create The Great Unknowns Scholarship, to assist eligible students who plan to continue their education in college or vocational school programs. The goal is to discover and reward young Americans who embody the spirit of “Give It Everything,” and help them pursue their academic dreams. Other elements of the integrated campaign include print, digital, social and outdoor. Post-Super Bowl, a sustain phase will follow with :60 and :30 cut-downs of “Give It Everything” along with spots highlighting the product features of the Telluride, including a Presidents’ Day spot. The digital rollout includes static and HTML5 banners across Lifestyle and Shopping websites and four feature-focused videos that will run in pre-roll.